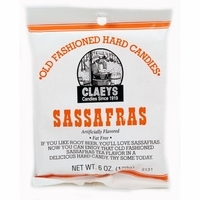 Now you can enjoy that old-fashioned sassafras tea flavor in a hard candy. Claeys are famous for their old time candy candy drops. A fat free candy with only 17 calories. These old fashioned candy drops come in many flavors to choose from; Anise, horehound, lemon drops or licorice. All made with natural ingredients in the USA.